1. 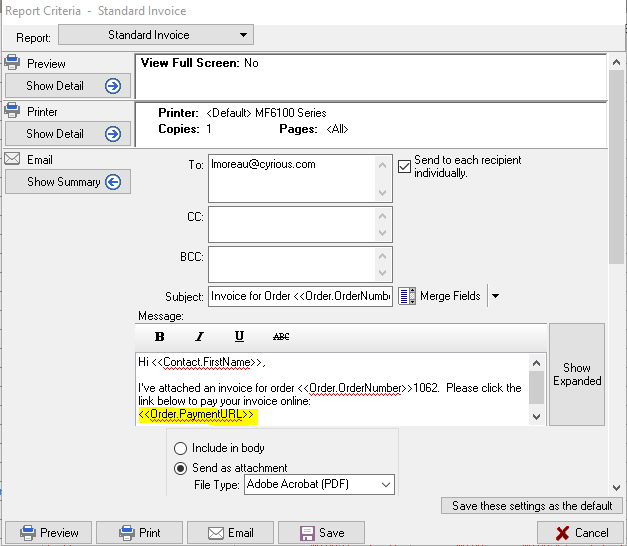 Optionally displaying a Pay Online button on the emailed Control invoice that the customer clicks and is sent to the checkout webpage. 2. Sending a URL in the body of an email that the customer clicks and is sent to the checkout webpage. You can choose to use one of the above methods or you can use both. The order cannot be in the Void status. The balance due on the order must be greater than $0.00. The Hide Online Payment Link option on the invoice must be unchecked. The How-To Setup Online Payments in Control#Cyrious%20Cloud%20Connector in Control must be turned on. When these 4 conditions are met, you will see the Pay Online button at the bottom of your invoice. When a customer receives the invoice, they can click on the link and have the checkout page opened in a web browser. The checkout page automatically pulls the information about the order from the Control database. NOTE: Custom invoices created prior to version 5.75 will need to be modified to add the Pay Online button. Instructions on how to do this can be found how_to_add_the_pay_online_button_to_a_report. When your customer receives their email, they can click on the link and have the checkout page opened in a web brower. The checkout page automatically pulls the information about the order from the Control database.